Legendary Pakistani batsman Hanif Muhammad passes away on 11th August 2016. International Cricket Council (ICC) has expressed sadness at the passing away of former Pakistan captain and ICC Hall of Famer Hanif Muhammad, saying that he was an inspiration for many batsmen. Hanif, who was 81, passed away after battling cancer. 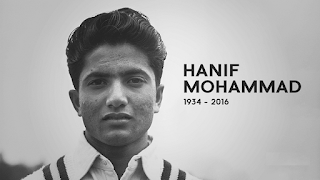 In a statement, ICC Chief Executive David Richardson said Hanif was one of the top cricketers of all-time and an idol for many batsmen. Known as Asian Bradman, Hanif was suffering from lung cancer for which he underwent surgery in London in 2013. He was shifted to the ventilator at the Aga Khan Hospital here a couple of days ago after his health deteriorated. Hanif was admitted to hospital three weeks ago following breathing problems.